Roanie was part of a group of sheep that I purchased sight unseen. I hadn't planned on keeping her. Phenotypically she wasn't what I wanted to reproduce, so I had planned to get her back in good condition and then sell her. But . . . Someone got into the isolation pen and attacked sheep. "I was never convicted of that!" Roanie was seriously injured. The dog had mangled her back leg. 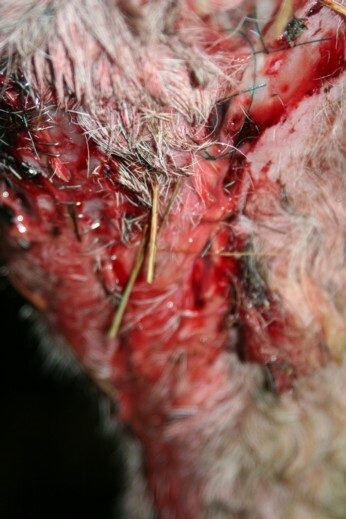 Roanie had to endure the stitching and initial treatment, and then daily injections of penicillin. We discussed amputating the leg. We discussed euthanizing the ewe. 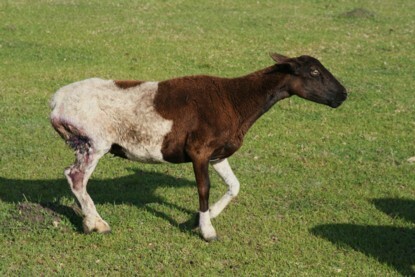 The ewe with less serious injuries later contracted tetanus (despite being vaccinated!) and had to be euthanized. We considered euthanizing Roanie, but she was such a trooper that I couldn't do it. If she wanted to live, I was willing to help her. 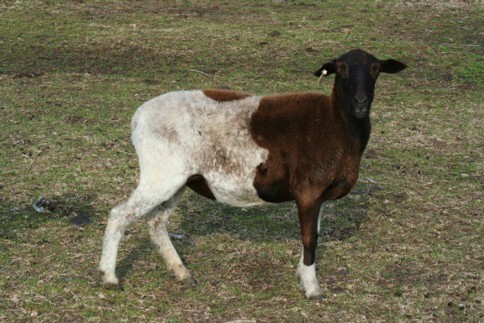 After the other ewe died, the vet told us to just throw Roanie out with the rest of the flock and hope for the best. So we did. At that point, you could literally see daylight through her leg. 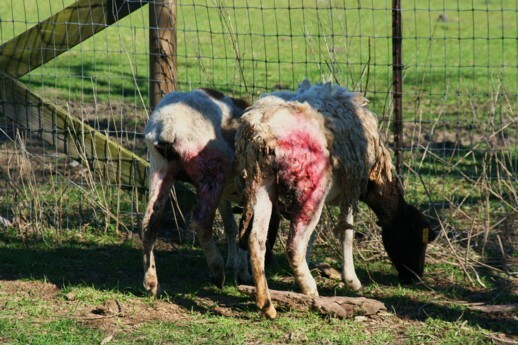 Briar was just a puppy then, but she immediately gravitated to the injured ewe. She became Roanie's Florence Nightingale. 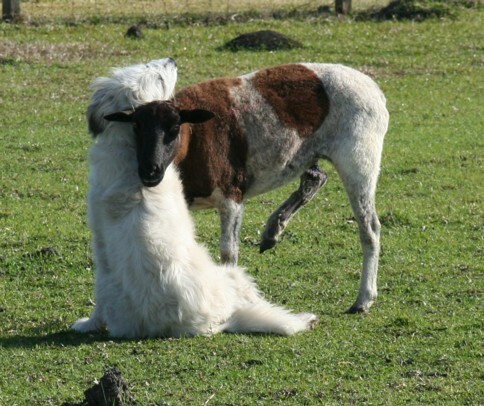 Roanie, the ewe who had every reason to be afraid of dogs, somehow knew this dog was different. 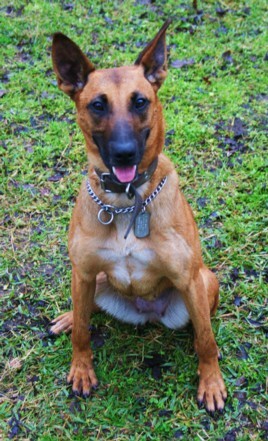 At the time, we felt she was destined to live out her life with a permanent severe limp, but we decided to keep her. We figured that with her limp, she couldn't be used for breeding, but she could be an auntie for weanlings. 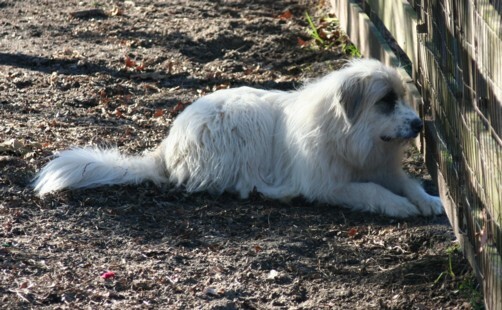 Besides, I felt we owed her, since it was my mistake that allowed the dog to get to her. So Roanie and her Florence Nightingale puppy hung out in the pasture together, and over time though, her limp became less and less noticeable. Then there came a point where she was able to keep up with the flock with little or no limp. As winter approached, it became apparent that like everyone else, Roanie was pregnant. She had no trouble carrying the extra weight. Her leg is a tiny bit shorter, but otherwise, she is fine. We decided to keep whatever baby she had. If it was a ewe lamb, I had already determined that it would stay simply because Roanie is such a fighter that I need genes like that in the flock. And if it was ram lamb, we would just neuter it and keep him as a wether to work the dogs and wean babies. Sunday morning, Roanie blessed us with twins. I checked her at 3 AM. No babies. 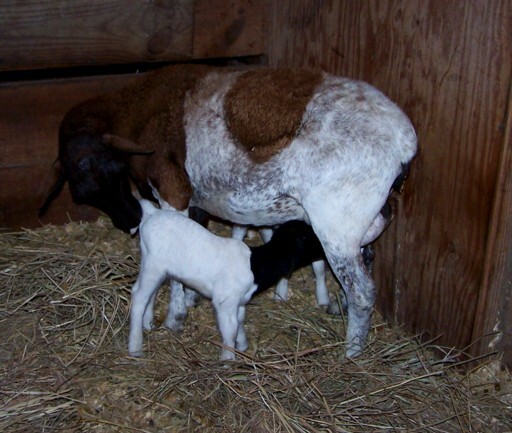 By 8:30 AM she had two healthy, clean and dry little guys. They are both rams, but we will be keeping them. 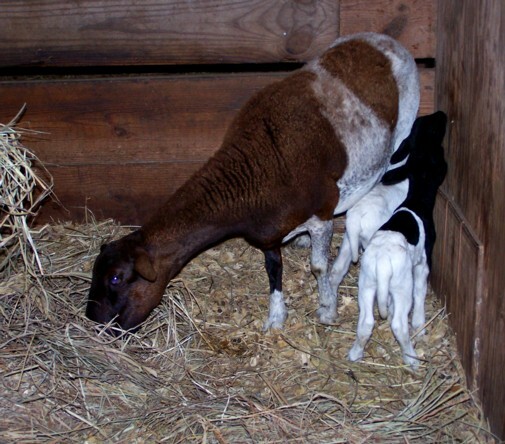 Despite everything this ewe went through, she not only survived, but she thrived and reproduced. I try not to get sentimental about the livestock, but Roanie is special. We'll be keeping these little guys. As yet, Florence Nightingale hasn't been allowed around Roanie's new babies, but I imagine that everyone will be just fine. *Sigh* I still get all snivelly when I look at her earlier pics......what a fighter!!! Where does she stand in herd hierarchy??? That picture of Roanie and Briar hugging, tugs my heart strings everytime I see it. I kept a doe kid last fall. She contracted the pneumonia that swooped thru Oklahoma in July. She survived but is a tiny litle thing. I promised Lyric(her name) that if she lived, I'd never sell her. She fought and won and now I have her in my herd forever. I like the markings on the babies too. The one with the saddle is certainly easy to pick out! Briar is ready to see the babies, but I haven't allowed them in pasture because it is wet and muddy and I like to keep brand new babies dry and clean until I'm certain they're healthy and will survive. I am also a sucker for those pics of Briar and Roanie. It was such a magical moment and I consider it a blessing that I was there to photograph it. Oops! Diane, I'm sorry I didn't answer your question as to Roanie's place in the flock. I don't have much of an answer. She doesn't get picked on and she doesn't pick on anyone else. My flock only has two ewes that stand out as being really dominant. (Ma & Rasta the Nasty) No one really stands out as being on the bottom. Ma is the clear leader. Rasta is the self-appointed defender of the flock.